I'm NOT superstitious. It is difficult, however, to dispute hard, cold facts that appear to support an unscientific belief. I came home Thursday evening instead of Friday this week because of the long weekend. As we were preparing for bed, Phillip arranged his clothes carefully because "Dad is home, so there's a good chance we'll get a call." Since I started working in Thunder Bay, I've only missed one call . . . and I'm gone for the better part of five days a week. It could be written off to the possibility that people are more likely to get into trouble on the weekends, but our last call was on a Tuesday. A moose just happened to walk in front of a car on a night that I just happened to be home (on a night that I'm not usually home). In keeping with the fast-growing belief that my presence in the neighbourhood precipitates 911 calls, another moose walked in front of another car on Thursday night . . . which is another night that that I'm not usually home. I've been to lots of these, but I am still awed by the phenomenon of a moose cleanly shearing the roof off a car. This particular time, the metal was peeled like it had been cut with tin snips, and smashed into the back seat. The driver sustained severe head injuries, and will need to keep company with a good plastic surgeon for a while, but he's very fortunate to still have his head on his shoulders. 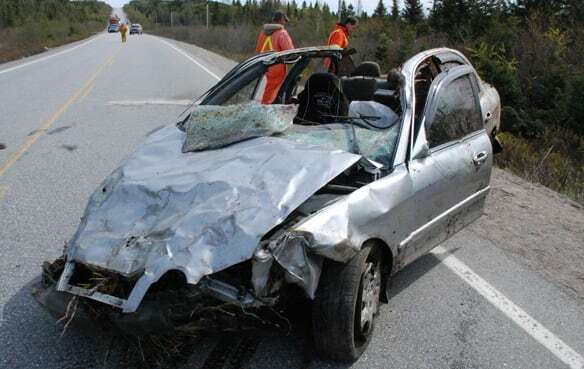 If you're curious, here is an example from another crash in another province where another moose just happened to walk in front of another vehicle. I have never been to Newfoundland, by the way, which is proof that stuff happens whether I'm in the neighbourhood or not. Even though I'm not superstitious, I do always lay my clothes out carefully before going to bed. You have to be ready because you can never predict when stuff is going to happen. If you want to avoid hitting a moose while driving through the Upsala area (with a side benefit of combating a non-scientific belief spreading through our ranks), check out this WikiHow site. I received an email the other day from a Discovery Channel program called Canada's Greatest Know-It-All. When I realized it wasn't a hoax, I was flattered for a few seconds. They said (and I quote): "We are currently looking for Canada's best and brightest minds . . ."
"Wow," I think, "Somebody is FINALLY acknowledging my great contribution to literature . . . " Then I read further. "Please let me know if you would be able to assist us in finding appropriate candidates for the show by reaching out through your contacts, social media or posting the casting call on your website." "So that's the deal," I think. "I'm not so bright, but I might know someone who is." Of course, my first thought was that they heard I knew Graham the Shark and Frank the Killer Whale, either of whom could probably win the competition, but neither of whom is likely to take a month off in June to enter. I'm afraid I can't help with this one. I may know two people who between them know nearly everything there is to know about anything, but I don't expect that I can persuade them to go on national television. They are both too busy protecting their own neighbourhoods, because stuff happens there too. If you happen to know someone that knows everything and can take the month of June off, here is the link to the Canada's Greatest Know-It-All site.